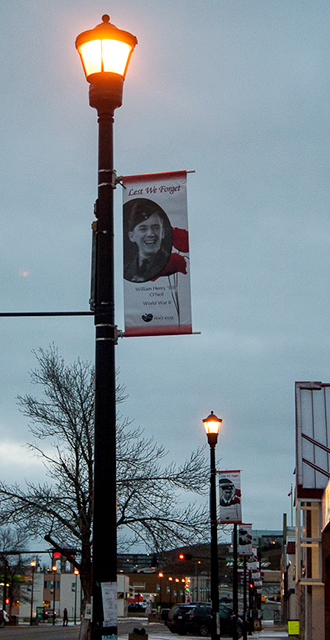 Launched in 2016, Banners of Remembrance is an effort by the Town of Peace River to keep the flame of remembrance burning bright by highlighting our local veterans through commemorative light standard banners. These banners feature a photo, the name of the veteran and the conflict in which they were a part of. The initial 29 banners produced in 2016 were put together based on research by the Peace River Museum, Archives and Mackenzie Centre, and the Royal Canadian Legion. If you interested in applying please fill out the form below. There are two key styles for the banners based on appropriate use of the poppy image. Royal Canadian Legion standards require that the poppy is used in conjunction with deceased veterans only. In cases where the veteran is still alive, or the person is not a military veteran but played a support role (merchant marines, War Office staff, etc. ), the photo and info is overlaid on a different design. Utilizing the two designs allows us to honour all our veterans appropriately while providing an opportunity to highlight the many non-combatants and civilian support who helped and who also sacrificed much. Initially, 29 banners were put together in order to establish a design, program parameters and to get the program started, in 2017 an additional 17 were added, in 2018 another 12 were added bringing the total to 58. Over time, we hope to build on that number through community submissions and banner sponsorship. Please note: only veterans or support staff with a direct connection to Peace River will be considered and all submissions will be vetted by the Peace River Museum, Archives and Mackenzie Centre as well as the Royal Canadian Legion. The Banners we have already completed are linked below. Click on the name to see the banner.